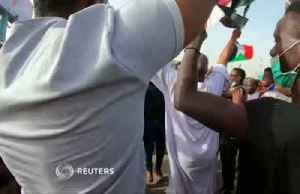 By Khalid Abdelaziz KHARTOUM, April 15 (Reuters) - Sudanese protesters moved to block an attempt on Monday to break up a sit-in outside the Defence Ministry, where demonstrators have been pushing for a..
Celebrations erupted outside the Sudanese defence ministry after Vice President and Defence Minister Awad Mohamed Ahmed Ibn Auf announced that Sudanese President Omar al-Bashir was deposed. 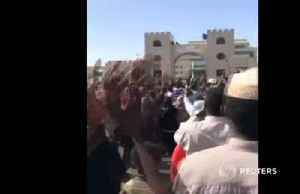 Edward..
Footage has emerged appearing to show Sudanese soldiers protecting demonstrators as thousands of anti-government protesters gathered outside the Defence Ministry in central Khartoum. 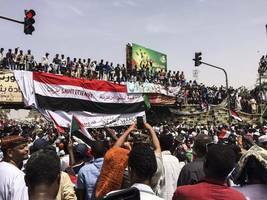 Edward Baran..
Sudanese security forces, firing shots into the air, launched a new attempt on Tuesday to disperse anti-government protesters camping outside the defense ministry, witnesses said. 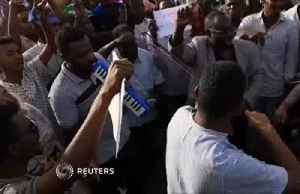 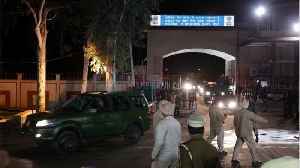 Heavy gunfire was heard at a protest outside the Defence Ministry in Sudan's capital Khartoum on Tuesday, live broadcast by al-Hadath TV showed, and activists said in a statement that security forces..